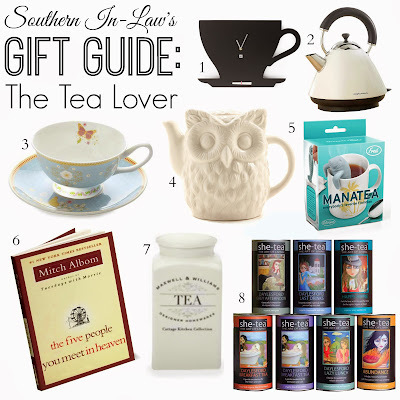 Southern In Law: Gift Guide: For the Tea Lover! 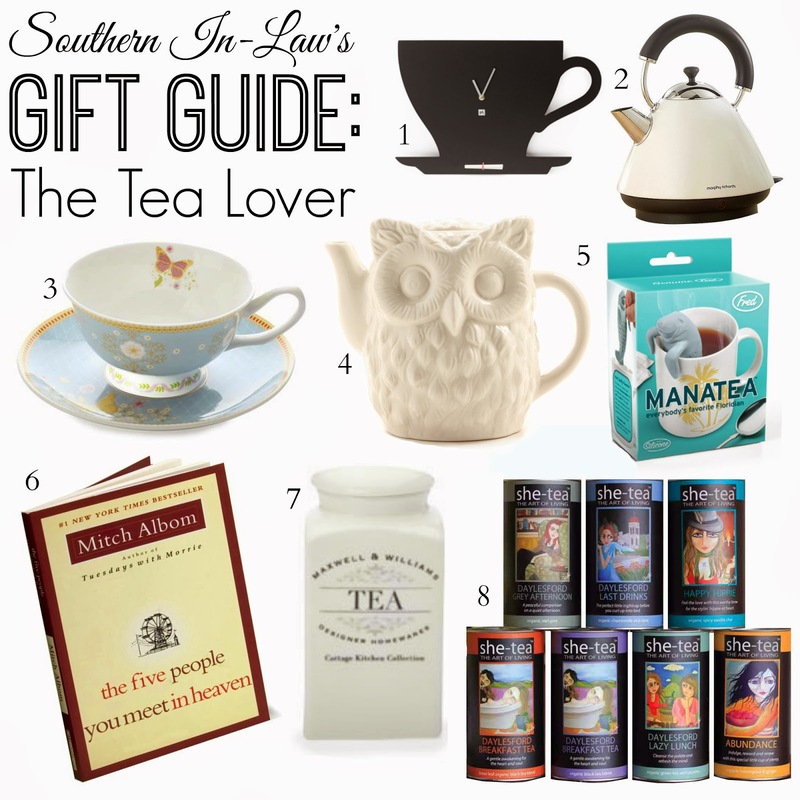 Gift Guide: For the Tea Lover! Eek! It's the first of December already! That means there's 24 days to get your Christmas shopping done - who's started, who's finished and who's not even thought about it yet? I have bits and pieces here and there but still need to buy some more presents for my favourite people - but today, I'm sharing our Gift Guide for the Tea Lover - and there are plenty of gift ideas at a range of different prices! I love this Tea Time Silhouette Wall Clock from Kitchenware Direct ($74.95) and I think it's the perfect decor piece for a tea lover - it won't look out of place or tacky in your kitchen, it serves a purpose and it's super cute! It's also painted in chalkboard paint so you can write messages right on the clock - just don't forget the battery! I'm currently a little bit in love with this Morphy Richards Kettle from Target ($119.95) thanks to its vintage style - but if it's a little bit too pricey for your budget, Kmart also have a very similar Pyramid Kettle in Almond for $39 (and it also comes in Red). I may be a dork, but when I drink tea out of a nice tea cup, it feels more important and I enjoy it more. I can never have enough tea cups or mugs and I know many tea lovers are the same. This Enchante Jacqueline Cup and Saucer from Kitchenware Direct ($11.95) is the perfect stocking stuffer, Kris Kringle/Secret Santa present or affordable gift for a tea lover. The only thing better than a cup of tea is a book to curl up with. My absolute favourite book is The Five People You Meet in Heaven ($9.80 - $13.20 at Book Depository with Free Worldwide Shipping) and I've actually asked for Mitch's new book, The First Phone Call from Heaven ($19.69 at Wordery with free shipping) for Christmas as I have read and loved all of his books. I can't recommend Mitch Albom's books more! I love finding new varieties of tea and the She-Tea organic range of teas are packaged beautifully so they're the perfect Christmas Gift. From the Happy Hippie (Organic Chai with Vanilla) to the Sweet Tooth (Black Tea with Caramel) to the Top Bloke (A Strong Black Tea Blend) there's a tea for everyone! Teas range between $5-18 or $80 for a 6 tea pack. But tell me, are you a tea lover? What would you add to this list? 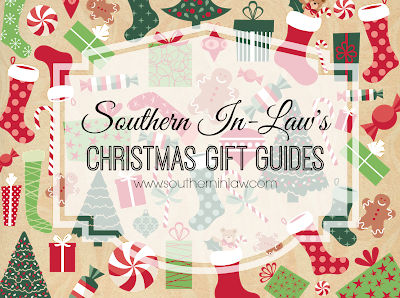 And what's on your own Christmas List this year?